In this show we look at the ethical and practical implications of research into the placebo effect, and discuss whether it’s okay – or even necessary – to lie to patients. The answer, from me at any rate, is “no”. And for those of you who don’t want to install Realplayer, a thoroughly stupid piece of proprietary software that messes with your computer and has the arrogance to put the “Real.com Message Centre” in your taskbar to harrass you with stupid pointless adverts about celebrities (the BBC, of all people, what on earth are they thinking…) then I will illegally record my own programme off the radio and post a proper normal mp3 file on this page once it’s been broadcast, unless someone important reads this and tells me not to. I genuinely love radio 4 science, as I’ve said before. It takes days and days and days to make a programme, and there’s absolutely bugger all money in it, but they really are the only place in the media where you can find clever people to generate and broadcast intelligent science content (Matt Silver, the producer, was brilliant, and is off to do a PhD in bioinformatics now). I’ve been trying to get them to let me do a short series on the crimes of the pharmaceutical industry, which is what I teach medical students and doctors, and it’s riddled with interesting bits of science and anger-provoking badness. The pitch is in for this round I think, so fingers crossed and all that. Oh, and my book is out next Monday. It really is. And it’s actually pretty good. I should start going on about it soon. Oh, cool about your book. Will you be able to hawk copies on Saturday? MP3 is stupid and proprietary too, you know? I’d appreciate Ogg Vorbis if it’s not too much hassle. I managed to listen to the first part, but I can’t get this part to play. Pro reason, you have to wait until after the program has aired tonight. That is why it is called listen *again*. It’s a fair bit after 9 o’clock over there in the UK by now, isn’t it? I still can’t get any audio. I hate streaming media. Oh for a simple .flac or .ogg file. 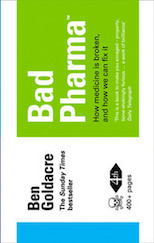 Just some ‘thinking out loud’ views on the placebo info coming from Ben’s radio programmes – and I have no medical background either, so bear with me! Firstly, it seems obvious to me that placebo, in any of its pill-like or other forms, would be of use to patients who have illnesses where, dare I say, psychomatic effects are present, or at least where ‘mood’ is playing a role in a illness which normally be controlled in a normally healthy person. That doesn’t surprise me at all. And any supposed immorality arising from deliberate use of placebo in such circumstances by a GP, treating a cold, or sore throat, for example, seems to me to be of no importance – just the equivalent of soothing words. Secondly, the big surprise is that placebos can induce bio-chemical changes in the body, and that this may help in the treatment of some more serious illnesses. This was the fascinating aspect to me. As Ben indicates, the moral aspect of using placebos here seems a minefield and isn’t clear to me. Thirdly, no comment was really made in the programmes on the limits of placebo for ‘serious’ illnesses (let’s say most cancers, heart disease, HIV, etc). In these cases I can imagine placebos having no important biochemical impact – I cannot believe there’s a placebo contribution to chemotherapy, for example. But possibly they could help induce a ‘positive mental outlook’ in the patient on the basis of false hope which could improve quality of life for a time anyway. I’m not recommending it as it’s immoral certainly, and of no long term benefit but arguably an alternative approach for those who can’t face a terminal diagnosis. It’s this hope via placebo that quack therapies are offering to the seriously ill and why they can claim to offer some benefits in such circumstances. Anyway, just some thoughts stimulated in me by these fascinating programmes which I thought I’d share! It is a little known fact that the pills in the first Matrix film were a placebo. Keanu Reeves only had to be acknowledge the existence of reality to himself – he didn’t need a drug. (This may be ruined by the sequels which I never saw on the grounds I have never met anyone who thought they were worth watching). don’t have my normal laptop / internet at the mo (moving) so if anyone happens to be able to record this and bung me an mp3 i will be able to stick it up in that form much quicker, ie immediately. otherwise realaudio’s not THAT bad…. If anyone’s after an alternative to Real Player to listen to Ben’s prog, I’ve had great success with “Real Alternative” (google it). Does everything you would want (i.e. makes sounds when you click the link) without the unnecessary “features” like the “Real.com Message Centre”…. As a clinical hypnotherapist and NLP Master Practitioner and Trainer, I have come across the placebo effect and have some theories about how it works. The mind and body are the same system, and a change in the body will cause changes in the mind, and vice versa. Simply changing your physiological state (for example sitting hunched over, looking down, will tend to depress your mood. In contrast, try to be unhappy whilst looking up and sitting or standing tall. There will always be exceptions to this ‘rule’, however! Of course, the moral arguments still remain, and if the patient knows the pill is a placebo does it have the same effect? I guess I’ll have to listen to the podcasts to find out…! Whats goes against a holistic view of health in which the cultural, economic, psychological, physiological (etc) are integrated, is not allopathic bio-medicine per se. but politics, specifically a contemporary political agenda that seeks to atomise health by breaking it down into measurable parts for economic measurement and profitable gain. As Atul Gawande has pointed out (i don’t have the reference to hand but you could start here www.gawande.com/articles.htm), the most effective way to improve healthcare is by allowing clinicians to spend more time with their patients, not by doing more investigations and procedures. In these cases (as in much of General Practice) care extends far beyond drugs and placebos. Signing up to the Bad Science iTunes podcast was a rewarding experience this week. Yes, that’s something I thought about too. For example, a fair few homeopaths have healer fantasies about curing serious diseases (like those you have named) with their sugar pills and magic water. I find the discussion about the ethics of lying to patients interesting, but surely it is something that could not even be considered in cases such as cancer etc. but is mediafire always so slow – I know my connection is often slow but 6KB/sec?? I’ve just listened to the 2nd program and what struck me was the bind a placebo puts a knowledgable patient in…. You’ve had the placebo (and good doctor patient relations) and you havn’t been able to persuade your body to respond, so it is all your fault that you are not getting better…..
Whoops that’ll teach me to read the posts above before sticking my oar in. Anyway hope the link is useful. Placebo effect is too simple a term to adequately describe this range of processes, so we/you/ Ben(!) need(s) urgently to develop the necessary lexicon so that when we say ‘snake oil’ we’re not talking about good communication skills. 25MB? That’s a bit much. The size of the whole Realaudio stream is only 14MB. There’s no point trying to re-encode it at such a high bitrate. You’re trying to encode data that ain’t there. I’ve re-encoded it as Ogg Vorbis, with a low, variable bitrate. You can hear the compression, but it’s worth it for the file size. I could add a few MB and make it sound perfect. Thanks for mp3 JB – will now enjoy Placebo train journey tomorrow am. Am not sure what to do with Oggs but they sound nice. Ian – agree – can intelligent, reasoning sceptics benefit from the placebo effect? Yes Lemonade, definately. A couple of centuries back in the philosophers believed that intelligent, reasoning sceptics had separate centers for emotion and reasoning but now scientists believe that the separation of reason and emotion is not only futile, but impossible. That said, there’s a vast amount of ignorance about science and scientific method, statistical analysis and psychology that all contribute to the wonders of advertising, consumerism and new-age evangelicalism that rightly raise indignant heckles and Ben has to be cheered for trying to help us battle those who would exploit us with their false promises and dodgy marketing. We should be grateful that we’re better educated, less anxious, less narcissistic (and hence less vulnerable to exploitation) than others, and do our (Christian) moral duty by protecting those who are. Off the thread I know, but related to your high BBC media profile. Good chat on the breakfast sofa this morning on superfoods. I’m not sure how far rational persuasion is going to get on a programme where one of the main headlines is ‘Line-up on Strictly Come Dancing announced’. Are Richard and Judy still going? The irony is that the specialist is keen for referrals despite the absence of evidence because that’s how they get paid and the patient wants a referral because they don’t believe that their problem could be of a self-limiting type that can resolve without a ‘specialist’ intervention. Each alternate survey on the effect of mental attitude on cancer outcome reverses the previous published conclusion, turn about, it helps, it doesn’t. I don’t think there’s been one to say that being terrified and certain that you will die in agony improves the chance that you won’t, it’s positive thinking that is supposed to be the medicine. I think we have discussed a psychology experiment where the perceived value of financial advice in an investment simulation depended on the price charged for the advice, or somethiing like that. This probably maps to the abstract psychological element of placebo effect – someone is doing something nice for you – but that isn’t necessarily the whole story. Haere’s a thought: placebo vaccine. Bad iea, yes? Very interesting as usual . I am writing my MA project on ‘Placebo’ (cultural aspects …things like belief, role of religion and authority etc…) Dylan Evans has an interesting theory on placebo called the ‘acute phase response’ (you can download the pdf from his site). I like his idea that placebos largely ‘work’ with ‘defensive’ biological problems (this was Patrick Wall’s opinion with pain interventions). Dylan looks at conditions such as depression/anxiety/pain and some types of inflammation as amenable to ‘meaning responses'(Dan Moremans idea) As these problems contribute to a considerable amount of suffering in general society than the factors that enhance placebo reactions are probably worthwhile studying and attempting to enhance in clinical practice. For anyone that is interested Anne Harrington has a very interesting book out called the Cure Within – A History of Mind-Body Medicine which is relevant to the debate. I accidentally listened to Radio 3 but it was still a fantastic programme. Placebo: A intervention designed to mirror a trial intervention except for that aspect of the trial intervention under investigation. So for example in testing homeopathy to test whether the pills are active you would use the homeopathic consultation but with sugar pills. Additionally it can help doctors to be more aware of the complex way in which they are healers and not simply evidence-based prescribing machines. Re 39: a placebo doesn’t have to imitate a realistic non-placebo therapy except in the mind of the patient. For instance, mumbo-jumbo with a crystal swung on a string over your body could be a placebo process. And placebo isn’t only relevant to trials. The placebo effect may be all that a patient needs to relieve, say, chronic back pain, psychologically at least: so why do anything else? To avoid placebo side-effects perhaps – so we -do- need those trials.